It is exciting to see the recent explosion of children’s books on earth friendly topics. 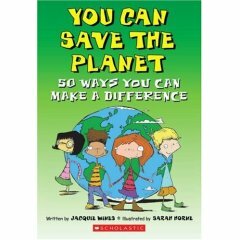 You Can Save the Planet: 50 Ways You Can Make a Difference by Jacquie Wines is a new book intended to empower children, and it reminds me of the older 50 Simple Things Kids Can Do to Save the Earth (published in 1990). Both books contain valuable information and unique tips for children to understand climate change. Could you name 50 ways children can save the planet? I don’t think I could brainstorm such a comprehensive list as in You Can Save the Planet, and these tips are good for the whole family (adults included). Some of the suggestions are specific and simple, like No. 46: Don’t Pick Wild Plants. Other tips are large and ambiguous, such as No. 39: Save Our Oceans. I think that all of the tips are useful for starting discussions with children of all ages, although the book is recommended for ages nine and up. There is only one tip that I question: No. 49: Go to the Zoo. Remember they are not just there for you to look at, however. They are there because we have destroyed their homes and habitats, and have hunted others near to extinction. Without your help, many of our favorite animals will no longer be seen anywhere on this earth. Families will learn a lot of facts about earth preservation and get new ideas for green family living from You Can Save the Planet. I don’t know if this book was printed on recycled paper with soy inks, but I do know No. 20: Fast Food is Forbidden! Fast Food is not forbidden. It is actually cheap than slow food. Making food in mass amounts saves energy. The only problem was their packaging and over the years they have improved dramatically. So THIS BOOK IS WRONG!